Dr. B.R. Ambedkar was the architect of the Indian constitution who drafted and shaped the Constitution in the favor of the country and its citizens. He was a learned scholar and an eminent jurist, served as the first law minister of the country. 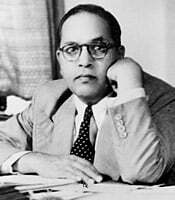 He had revolutionary thoughts against social evils of untouchables and caste system and also introduced the system of reservation in the Indian Government for the betterment of these backward classes. He was the revivalist of Buddhism and also the recipient of the Bharat Ratna award.